Clackamas County is celebrating the opening of a new village for homeless veterans located in the unincorporated area near Happy Valley off of Highway 212/224. 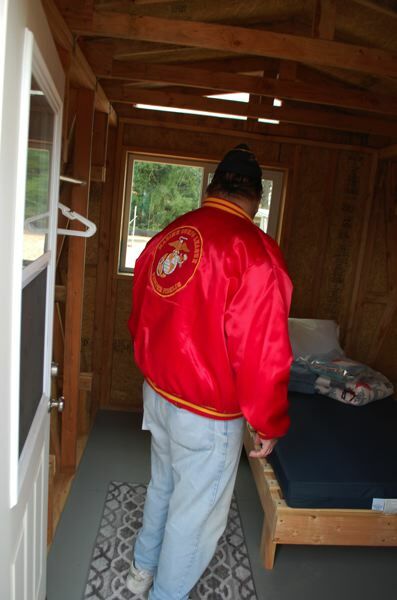 The Veterans Village is made up of 15 small wooden pods that resemble tiny homes, each with one small bed and closet space. The goal of the village is to get 15 homeless vets off the streets just in time for winter. In January 2017, 85 homeless veterans were counted in Clackamas County, 52 of whom were sleeping outdoors. 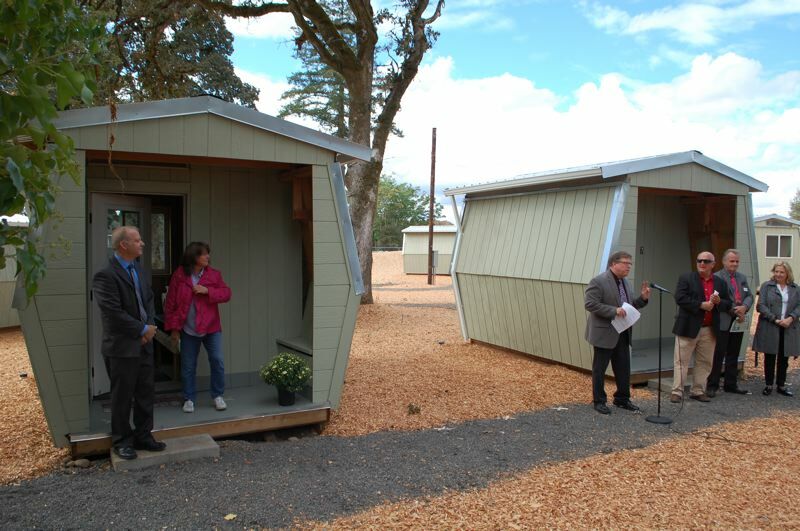 Officials hope to eventually build pods for 30 people at the Veterans Village. The sleeping pods have no electricity, running water or heat, but will have battery-powered lights installed for reading. Residents will share a communal kitchen and shower area toward the front of the property on 115th Avenue. "This project has been a catalyst in the community for pointing attention to the issue of homelessness," said County Administrator Don Krupp. "With this project nearing completion, I expect we will continue to hear from homeless advocates to hold our feet to the fire to continue developing solutions." County Commissioner Paul Savas has been credited with pushing to set aside an initial $300,000 for the project after getting the idea from local veterans nonprofit Fort Kennedy. The project has cost the county about $760,000, so far. For County Commissioner Ken Humberston, who is a veteran of the U.S. Marines, the project is personal. "I'm one of the lucky ones," Humberston said. "To have them make this happen for those who are not so lucky means so much to me." After about two years to planning and construction, the village will be staffed about 10 hours a day by members of the nonprofit organization Do Good Multnomah. Residents will be encouraged to maintain the kind of community they want to live in and help build additional pods. Officials hope to transition vets into better housing within a six-month timeframe. "We want to move them into permanent, supportive housing from here. But at least what happens here is we are able to get them in a place where we can provide services for them," said Kevin Ko, community development manager for Clackamas County. The wooden pods were designed by Portland State University students and built with old trusses that were used to build a stage at the Pickathon Music Festival in Happy Valley last summer. Emily Klepper, the county's Vets Village project manager, said there will be a two-year limit for residents to stay at the Veterans Village because of the goal for it to remain as transitional housing. Metro Councilor Betty Dominguez recognized the county for developing the first permitted and code-compliant transitional village in Oregon. She hopes the village will become a model for the nation and encouraged local voters in November to pass the $652.8 million bond for affordable-housing construction. "We need to pass that bond so we have the funds to develop the housing for these veterans to transition into," Dominguez said.